One of the side effects of prostate cancer treatment that especially concerns men is urinary incontinence. As treatments for prostate cancer improve, urinary incontinence will become less common. However, today men should be aware that there are effective ways to alleviate urinary incontinence. Surgery or radiation therapy may irritate the urethra or bladder or damage the urinary sphincter (muscles that contract to prevent urine from flowing out of the bladder). As a result, some degree of urinary incontinence (inability to control bladder function) is common immediately after prostate cancer treatment. For example, urge incontinence (the strong and sudden need to urinate, followed by a bladder contraction and involuntary loss of urine) is common for a few days after catheter removal in men who have undergone transurethral prostatectomy (TURP) for the treatment of benign prostatic hyperplasia (BPH). This story was published in Daily Newswatch on June 1, 2013. If Nigerians go to sleep and watch neighbouring countries like Sudan, Ethiopia, Chad, among others, where guinea worm diseases is still prevalent transmit the disease to the country, it may not be certified as a guinea worm free nation by the World Health Organisation, (WHO), come June 2013. For two decades, beginning from 1988, thousands of volunteers laboured to document every case of the disease and providing the tools and education necessary to defeat it. Nigeria had from December 2008 till date maintained a zero Guinea worm disease case status that is over four years. However, there are indications that some countries are still reporting Guinea worm disease and Nigeria is bordering some of the countries. Last month, the country celebrated her success in the eradication of the disease during the National Guinea Worm Disease Eradication Day. During the occasion, the Minister of State for Health, Dr.Ali Mohammad Pate, announced the proposed visit by the International Certification Team (ICT) for Guinea Worm disease eradication in June 24 to July 14, to assess Nigeria for consideration for certification. He expressed optimism that the visit of the international Certification Team will yield positive results pointing out that Nigeria will qualify to be certified free of Guinea worm disease this year. To this end, the country is trying to tighten every loose end to avoid the re-emergence of the disease. Already, Nigeria has increased surveillance on border posts to avert new infections in the country, even as experts are focusing on how to repeat her success in the last strongholds of the disease in southern Sudan, northern Ghana, and eastern Mali. The government has also offered a cash reward of N25,000 for every report of authentic new guinea worm cases in any part of the country. In 2011, a N10, 000 rewards was offered for a similar report. The government seems not to leave any stone unturned in the preparation to be officially certified a guinea worm disease free country. Speaking, last week in Kaduna, the Communication Officer, Nigeria Guinea Worm Eradication Programme, (NIGEP), Dorcas Mernyi, elaborated on the measures being adopted to avoid cross-border infections and ensure that Nigeria remains guinea worm free. Ms. Mernyi emphasised on the need to sensitise Nigerians to be more vigilant so as to avert contracting the disease from neighbouring countries where it had not been contained. “We are keeping surveillance over our borders because some countries are still reporting and Nigeria is bordering some of the countries. So our surveillance structure has to be very sensitive so that no case will be imported into Nigeria,” she said. According to her, cases of guinea worm diseases were prevalent in Sudan, Ethiopia, Chad and other border countries, hence the collaboration between the Federal Government and the neighbouring countries, to eradicate the disease. “It is a collaborative effort; we cannot do it alone. What Nigeria is doing is collaborating with other countries,” she said. “Recently, the National Coordinator for guinea worm diseases went for a cross border meeting with the countries bordering Nigeria. “We are fighting this together, we don’t want any re-bounce of guinea worm case in the country. We are intensifying surveillance at the borders, screening people that come in.” She said that villages bordering other countries had been engaged in community participatory surveillance, to assist government in checking the spread of the disease into the country. “People in the communities are helping us to look out. If we see a stranger, we find out who the person is, if we don’t understand, we report immediately. “We are not pursuing them out of the country, but we want to know who they are, where they are coming from and to make sure they are not bringing guinea worm disease into Nigeria,” she said. According to her, the Federal Government with the support from the World Health Organisation, (WHO), and other partners had built an information network from the national level through the states, local governments down to the villages. Also, during a roundtable on Media and Advocacy for guinea worm disease eradication pre-certification activities, Assistant National Co-ordinator of the National Steering Committee of the Nigeria Guinea Worm Eradication Programme, (NIGEP), Mr. Babatunde Tokoya, explained the essence of the financial incentives of N25, 000 to volunteers of information on fresh cases of the disease. Tokyo said the incentive was to sensitise the entire populace about the importance of guinea worm certification. “Any suspected case of guineaworm disease is to be reported to the nearest health facility and if it is confirmed, the reporter will be given a cash reward of N25,000. All suspected cases can be reported through a toll free line 08001001000,” Tokoya confirmed. The Assistant National Co-ordinator observed that between 2009 to date there have been 545 rumour cases of guineaworm out of which 21 were recorded between January and March 2013. “Before Nigeria can be certified guineaworm free, we must meet four distinct criteria. There has been no confirmed case of the disease in Nigeria since the reported 38 cases in 2008, down from over 653,000 cases at the start of Guinea Worm Disease eradication campaign in 1987. NIGEP has been championing guinea worm eradication efforts, focusing on surveillance, integrating guinea worm watch into other immunisation programmes with conscious efforts to improve water and sanitation in the identified 5,879 affected villages in 1998. Member of the Steering Committee, Mr. Buki Ponle, said the roundtable was to discuss, among others, specific roles expected of the media and also to unfold plans for a Media Merit Award which will climax media activities on guinea worm eradication. Guineaworm is infection with Dracunculus medinensis, a nematode worm. It is caused by drinking water containing water fleas harbouring Dracunculus larvae. There are no drugs for treatment but it can be prevented by protecting water sources and filtering potentially contaminated water. This story was published in Daily Newswatch on May 9, 2013. There is anxiety over Nigeria's preparedness to meet the Global AIDS Response Programme (GARPR) target. With barely 18 month to the GARPR deadline, fears are rife that the country may miss the target. According to the GARPR target, 15 million people living with HIV should be treated with antiretroviral (ARVs) drugs. This is because an estimated 1,449,166 still cannot access ARVs after 26 years that AIDS was first reported in the country, even as 3,459,363 people live with HIV (PLWH). This issue may be a big deterrent to the attainment of the 2015 Global AIDS Response Program (GARPR) indicator and target four according to experts. The latest Global AIDS Response Country Progress Report (GARPR) from National Agency for the Control of AIDS (NACA) shows that Nigeria accounts for 73.4 per cent gap in the number of people receiving antiretroviral therapy in low and middle income countries, by region, from 2002 to 2011. Though records show that there are eight million people on antiretroviral drugs following massive scale up of programmes, there were 388,864 new infections in 2011. Also, the country is among those with high AIDS death burden despite the drop in the annual national median HIV prevalence from 4.6 per cent in 2008 to 4.1 per cent last year. According to the UNGASS target / indicator the gap in the number of people receiving antiretroviral therapy dropped from 94.56 to 70 per cent between 2007 and 2010 and rose again to 73.4 per cent according to the GARPR 2012 target / indicator. In the United Nations General Assembly Special Session on HIV/AIDS (UNGASS) 2007 target / indicator, the country showed 94.56 per cent gap in the number of people receiving antiretroviral therapy according to International Centre for AIDS Care and Treatment Program (ICAP) record. In the UNGASS 2010 target / indicator, the country showed 70 per cent gap in the number of people receiving antiretroviral therapy according to the Federal Ministry of Health (FMOH 2009) While GARPR 2012 target / indicator showed 73.4 per cent gap in the number of people receiving antiretroviral therapy according to2011 records from FMOH. Corroborating, Dr Oliver Ezechi, Clinical Sciences Division NIMR in an interview said that the country showed a gap of 73.4 per cent in the number of people receiving antiretroviral therapy in low -and middle-income countries, by region, between 2002 and 2011. Experts believe that this trend is worrisome in view of the 2015 target to ensure that at least 80 per cent of adults and all children in the country have access to comprehensive quality HIV and AIDS treatment. This is a cause for big concern in view of th country’s preparedness to ensure that at least 80 per cent of adults and all children on ART have access to quality management of opportunistic Infections by 2015. With an estimated population of 162,265,000, Nigeria is the most populated country in sub- Saharan Africa, a region which carries the globe’s heaviest burden of HIV/AIDS. The most recent HIV Seroprevalence figure represents about 3.5 million people infected with HIV, ranking the nation as third among the countries with the highest HIV/AIDS burden in the world, next only to India and South Africa Although the national median prevalence of HIV has taken a downward turn in recent years, the absolute number of people living with HIV has increased by almost half a million people in three years and AIDS related mortality has also slightly increased in the same time period to about 217,148 annual deaths attributed to AIDS. While the annual AIDs death was 192, 000 in 2008, it rose to 217,148 last year. The country carries the second heaviest burden of HIV in Africa and has an expanding population of People Living with HIV (PLHIV). Despite challenges in scaling up access, institutional reforms and political commitment to tackle the diseases, the country has seen more citizens placed on life saving medication. In line with the World Health Organization (WHO), guidelines, government recently adopted antenatal care (ANC) sentinel surveillance as the system for assessing the epidemic. The national HIV Seroprevalence level, obtained from sentinel surveys of antenatal care attendees, increased from 1.8 percent in 1991 to 5.8 percent in 2001 and then declined to 5.0 percent in 2003 and further to 4.4 percent in 2005. This was followed by a rise to 4.6 percent in 2008 and then a recent decline to 4.1 percent in 2010. According to the ‘Brief on the HIV response in Nigeria’ from National Agency for the Control of AIDS (NACA) HIV incidence has fallen by more than 25 per cent, in 33 countries including Nigeria, between 2001 and 2009. However the number of new infections is still outpacing the number of those placed on treatment, the report said. When Prof. John Idoko, the Director-General, National Agency for the Control of AIDS (NACA), announced last December that more than N700 billion is needed to achieve universal access to antiretroviral (ARVs) drugs in the country, many keen watchers of the health industry were worried over the preparedness of the country to get towards zero AIDS-related death. He explained that there was a huge gap between persons accessing antiretroviral drugs and those requiring them, stressing that government must commit resources towards meeting their need. “Presently, only 432,000 persons living with HIV (PLHIV) are accessing the drugs in contrast with the 1.5 million people needing it. “We have realised that the Federal Government need to commit more funds to this cause; drugs are critical as they interrupt transmission,” he said. He reasoned that since the country was the second most burdened by HIV and AIDS in the world, hence the need to gather support to help in fighting the scourge. Idoko urged government to focus more on making HIV treatment cheaper by reducing the cost of drugs and tests, adding that there was the need to strengthen the health systems. The Director-General lamented that 12 states had HIV burden, adding that PMTCT gap should be closed by ensuring that all pregnant women had access to services to reduce new infections. 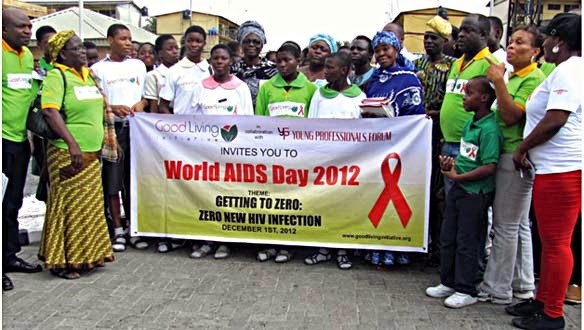 Also, Prof. Innocent Ujah, Director General, Nigerian Institute of Medical Research (NIMR), Yaba, Lagos, said “the goal of zero HIV relateddeaths in our country is achievable. This story was published in Daily Newswatch on March 21, 2013.